This is our upcoming girls night out .... to ENRICH us... project! 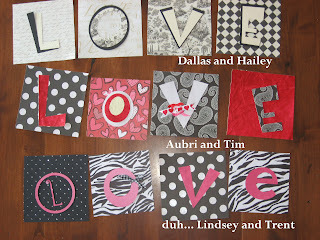 And, of course I had to make several... can you tell who the zebra and hot pink one is for? guess who gets to cut all the wood and is in charge of the night... you got it... Me!oh... and JAKE is the lucky wood chopper. (so far 50 people have signed up...) I think they will be lots of fun to make. We are supplying the wood, paint, mod podge, and several cricut machines and "the ladies" will bring their own paper. Not bad for a cheap enrichment-filled project huh? Jenny, you are so talented and creative and energetic. I need to be more like you. Here's my shout out to Jake. Happy B-day 34 year-old! LOVE them! You are so sweet to make a set for all the love birds! k ... so what size is your wood - just 2x4? they look bigger - and is it just paper?? modge podge? Instructions - must have instructions! !